Hooked on Needles: My 2011 Scrap Afghan in Crocheted Woven Stitch ~ Complete! 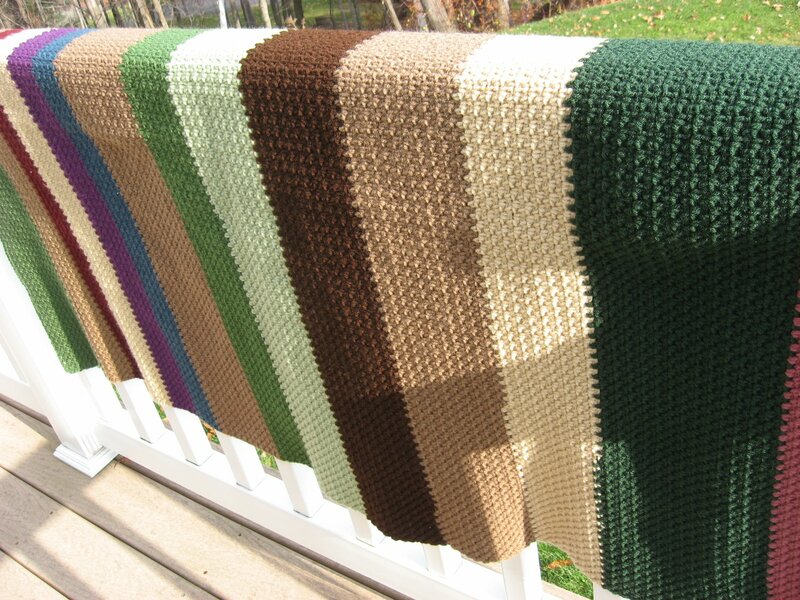 My 2011 Scrap Afghan in Crocheted Woven Stitch ~ Complete! 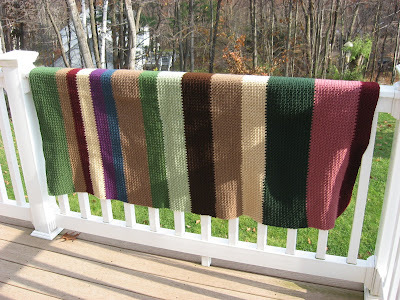 It's a scrappy afghan made with leftover Red Heart worsted weight yarn from other projects. When I recently cleaned out my sewing room and destashed lots of fabric and yarn, this is some of the yarn I had left. I had started this scrappy afghan last spring just to use up what I had left from the first Reflections afghan I made. 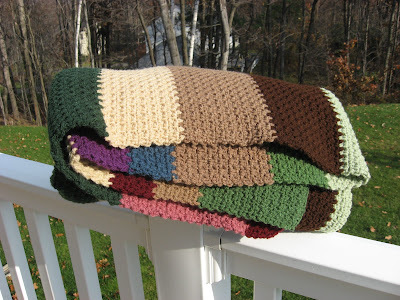 Then I had to stop working on it because the weather had warmed up, making crocheting much too hot to be enjoyable. When the cool weather returned, I had found more Red Heart that needed a home, so I started adding one color at a time until I had used up lots more leftovers! The woven stitch, shown HERE, HERE and HERE, is one of my very favorite stitches to use for a crocheted afghan, and that is what I used on this one. This picture reminds me of mint chocolate chip...YUM! Doesn't that look like a bundle of cozy? 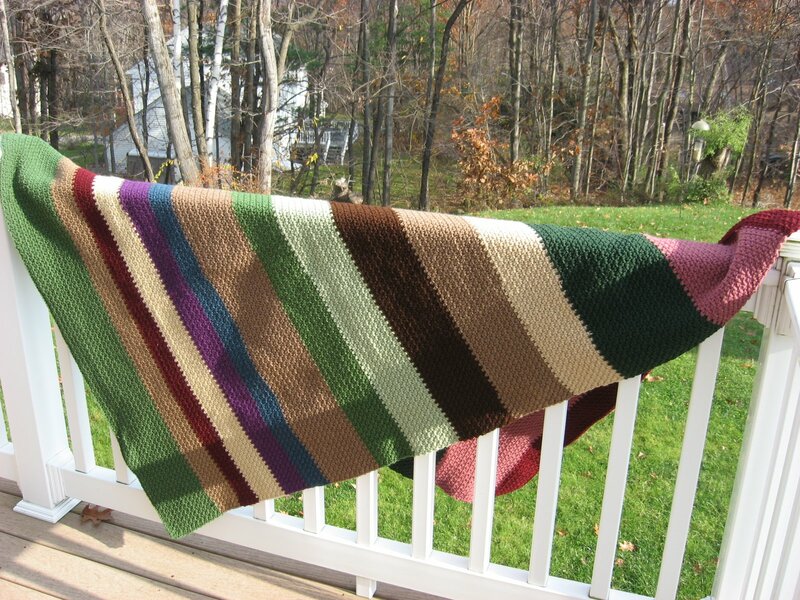 This afghan measures 42 inches wide by 60 inches long, is machine wash and dry, and has already been listed in my Etsy shop for sale. Think handmade for Christmas this year! And support your local crafters! Speaking of local, if you are local to me and interested in this or any other item in my shop, please let me know and I'll deliver, saving you shipping charges! And speaking of shopping, have you signed up for a chance to win a $25 shopping spree to my shop? Click over to The Girl Creative and follow the rules for your chance to win, then get working on that Christmas shopping! 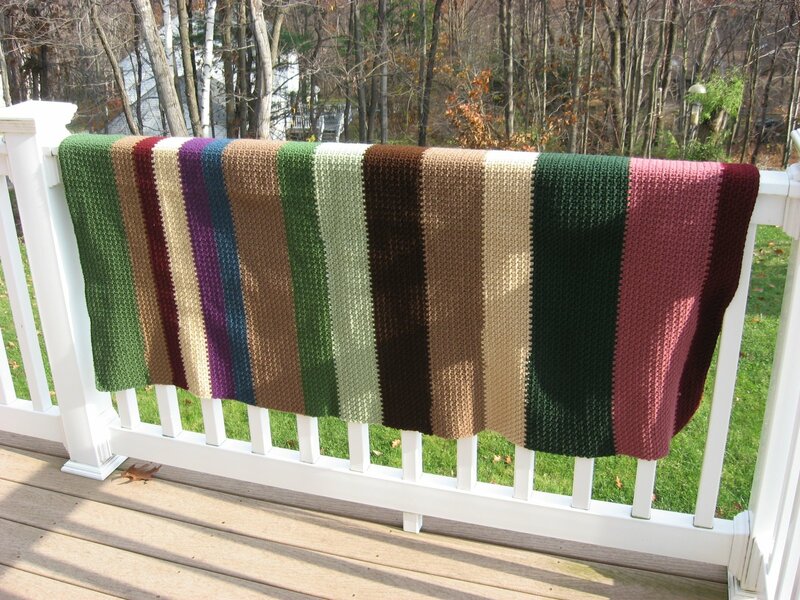 Love your afghan - perfect fall colors! I am going to have to remember the woven stitch when I get to the point of wanting to use up left over balls of yarn. 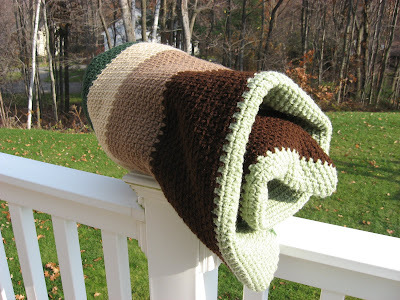 Your quilt does look like mint chocolate icecream! Absolutely beautiful! I have a ton of leftover yarn, and I think that this is a great idea to put it to use! 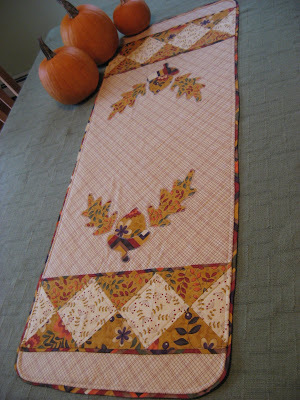 Fall 2011 ~ 800th Post Celebration! 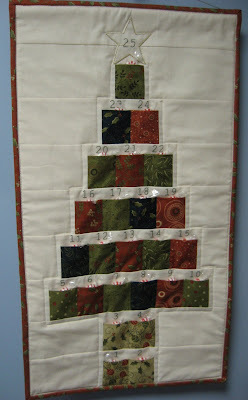 Karen's Postage Stamp Quilt ~ Coming Along! Sewing Room Clean-up 2011 is Complete!